It is widely taken for granted that physical lines are real lines, i.e., that the arithmetical structure of the real numbers uniquely matches the geometrical structure of lines in space; and that other number systems, like Robinson's hyperreals, accordingly fail to fit the structure of space. Intuitive justifications for the consensus view are considered and rejected. Insofar as it is justified at all, the conviction that physical lines are real lines is a scientific hypothesis which we may one day reject. KEY WORDS: infinitesimals, geometry, intuition, space, continuity. En general se asume que las líneas físicas son líneas reales, esto es, que la estructura aritmética de los números reales corresponde de manera única a la estructura geométrica de líneas en el espacio, y que otros sistemas de números, como los hiperreales de Robinson, no logran corresponder a la estructura del espacio. En este artículo se examinan y rechazan las justificaciones intuitivas de la posición de consenso. En la medida en que pueda estar justificada, la convicción de que las líneas físicas son líneas reales es una hipótesis científica que algún día podríamos rechazar. PALABRAS CLAVE: infinitesimales, geometría, espacio, continuidad. All of us, at some point in our high school careers, are introduced to the picture of the real line in Figure 1. As time goes on, and we are repeatedly exposed to this picture in various contexts, we may come to view it both as a geometrical representation of a certain number system R, the real numbers and also as a schematic representation of a property of lines in physical space, namely, that the points on such lines can be brought into a certain kind of correspondence with the elements of R.
How do we know that this picture, construed in the second way, is complete, i.e., that it tells the whole story? How do we know that there aren't, on physical lines, points way over to the right, after all the real points, which would need infinitely large positive coordinates, and points way off to the left which would need infinitely large negative ones? How do we know that there isn't a little stretch of the line around each real point, in which there are no points at all with real coordinates? The points thus clustered around a real point p would all lie infinitely close to it: their respective distances from p and thus also their respective distances from one another would be infinitesimal, i.e., less than any positive real number. Figure 2 (derived from Keisler 1994, p. 212, Figure 1) is a picture of the hyperreal line, which has the features just listed. Like the more familiar Figure 1, this picture corresponds to a number system, this one known as the hyperreals H, discovered by Abraham Robinson around 1960.1 The hyperreals are a superset of the reals, and have all the firstorder properties of the latter; we call the real elements of H standard and all the rest nonstandard. Robinson's work should lay to rest any lingering doubts about the logical status of infinitesimals, which Berkeley, Russell and others had seen as flatout inconsistent. But if no logical contradiction lurks beneath the surface of Figure 2, then how are we to account for the consensus that rejects it, in favor of Figure 1, as a depiction of lines in space?2 More picturesquely: how do we know that physical lines are real lines, and not hyperreal lines? Hilbert's axioms come in five groups, the first four comprising the Axioms of (I) Incidence, (II) Order, (III) Congruence and (IV) the Parallel Postulate. Let us call a geometrical system satisfying Groups IIV a manifold.5 A manifold is a threedimensional space (in the abstract sense of 'space') in which many of the theorems of Euclid's Elements will hold good. Completeness: Let all the points on a line be divided into two nonempty sets SL and SR such that every point in SL lies to the left of every point in SR. Then SL has a rightmost point if SR has no leftmost one. (The relations "to the right of and "to the left of", which I have made use of here for clarity of statement, are easily definable from the primitive relations of Hilbert's axioms. )6 A complete manifold satisfies this last axiom (or, equivalently, satisfies the axioms in Hilbert's Group V) as well as the axioms in Hilbert's first four groups. A complete manifold is thus a threedimensional system of points, lines and the rest having all the geometrical properties of the abstract spaces we study in high school analytic geometry, and a manifold more generally conceived is a threedimensional system having very many of those properties. Of course, what makes analytic geometry analytic is the use of numerical coordinates, and I have yet to say anything about them. Broadly speaking what we do when we apply coordinates from a number system S to a manifold M is to assign to each point of M an ordered triple of elements of S in such a way that the geometrical structure of M is exactly mirrored by the arithmetical structure of S. So among other things the betweenness relation that orders the points of M will get captured by the arithmetical ordering of the numbers in S: for instance, the point with coordinates (0, 1, 0) will lie between those with coordinates (0, 0, 0) and (0, 2, 0). Given a Pythagorean field P we can define a structure MP, the Cartesian manifold over P, whose points are ordered triples of P, and whose planes are solution sets of linear equations in three unknowns with coefficients in P; we define the distance between two points to be and so on. The Cartesian manifold over a Pythagorean P is a manifold, i.e., it satisfies all the axioms in Hilbert's first four groups (Hartshorne 2000, p. 153). Now let M be an arbitrary manifold and P a Pythagorean field. Then a Pscale on M is just an isomorphism f from M onto the Cartesian manifold MP over P, i.e., a oneone correspondence that preserves all geometrical properties and relations: lines are mapped to lines, planes to planes, etc., and relations like betweenness and congruence in the two manifolds are mirror images of one another. For betweenness, this means that the point p of M is (M)between q and r just in case the point f (p) of MP is (MP)between f (q) and f (r); likewise, for congruence it means that the segments pq and of M are (M)congruent just in case the segments f (p) f (q) and f (r) f (s) of MP are (MP)congruent, i.e., just in case Δ ( f (p), f (q) = Δ f (r), f (s)). We call the point with coordinates (0, 0, 0) the origin of the scale. If there is a Pscale on M we call P a scalar system for M. The kind of rectangular coordinatization we study in high school is a special case of this more general notion of a scale, viz., the special case in which our scalar system is the real field. Here are a few key facts about scales and manifolds. What I will call the Scalar System Theorem says that every manifold has exactly one scalar system and that every Pythagorean P is the scalar system for some manifold. The Uniqueness Theorem says that if M is complete, then its scalar system is R.7 It is an easy exercise in high school analytic geometry to define, given an Rscale on a manifold, a onedimensional (onecoordinate) scale on any line of the manifold, and conversely to extend a onedimensional scale on a line to a threedimensional scale on the whole manifold.8 This carries over into our more general setting, and guarantees that there will be a Pscale on M just in case there is one on each line of M; we may accordingly view any given scale indifferently, in keeping with the exigencies of the moment, as defined either on the whole manifold or on just a single line. We will find it helpful later on to have in hand the notion of a Prule on a line L: this is an order and congruencepreserving bijection from a (possibly proper) subset of L onto P. Whereas a scale assigns a coordinate to every point of L, a rule may miss some. If h were an Hscale, for instance, on the line in Figure 2, the restriction of h to the points whose hcoordinates are real would be an Rrule on the line. Now let us return to and reformulate our original question about real versus hyperreal lines. Departing somewhat from the physical facts as we now understand them (though not in any way that will affect the general points I wish to make) let us take it for granted that space is a manifold. It follows by the Scalar System Theorem that space has a scalar system S, which is a Pythagorean field. Since H and R are both Pythagorean, either one could for all we have said so far be S; by the uniqueness in the Scalar System Theorem these are mutually exclusive alternatives. Our original question boils down to that of how we know that S is R and not H.
By the Uniqueness Theorem we could single out R, and rule out H, by showing space to be complete. To get an idea of what is at stake here, let us consider what space would be like if it were not complete. For definiteness, suppose that S = H, let f be an Hscale on L, let SL be the set of all points of L with negative or infinitesimal coordinates, and let SR be all the rest. Because the sum of two infinitesimals is itself infinitesimal, SL has no rightmost member. Because every finite hyperreal lies infinitely close to a standard real, and there is no least one of those, SR has no leftmost member. But SL and SR satisfy all the hypotheses of the Completeness Axiom, so they dramatize the incompleteness of the hyperreal line (Figure 3). You may now find yourself wanting to protest that space certainly cannot be like that, that this is a reductio ad absurdum of the suggestion that physical lines might be hyperreal lines. If so, then ask yourself where the contradiction lies, what the absurdum is that makes this a reductio. You might feel that the force of our vignette is to highlight a certain feature of hyperreal lines, a feature we can just see that physical lines lack. If so, you would not be alone. Appeals to some kind of "seeing" are a staple of debates over the infinitely small: the unimaginability of infinitesimals is a major theme of Berkeley's Analyst, and I have heard the question "have you ever seen an infinitesimal?" thrown down as a challenge to Robinson's hyperreals. Most of us believe that there are stretches of space too small to be seen, even with a very powerful microscope; certainly anyone who believes in Rscales on the line, or takes modern physics at face value, is committed to such stretches. So these invocations of "seeing", if they are supposed to cast doubt on infinitely small stretches, cannot just be straightforward appeals to perception, since the latter does not even take in all the finitely small stretches we believe in. Presumably the "seeing" in question is supposed to be some kind of intuition, some faculty whereby we gain direct access to objects which is, in a famous phrase of Gödel's, "something like a perception" (Gödel 1947 (1960), pp. 483484). 'Intuition' is a big word in philosophy, and not all of the philosophical uses to which it has been put fit this mold of "seeing" objects.10 I will concentrate here on one that does fit that mold, which (following my usage in Moore 2002) I call quasisensory intuition, whereby we allegedly learn about the world by reflecting on our mental images, and our capacity or incapacity to form images of certain kinds. The great advantage of quasisensory intuition is its reliance on data with regard to which there is a good deal of intersubjective agreement. Its great disadvantage is the inferential gap between assertions about our imaginative capacities and assertions about the world around us: why should we take the former as a reliable guide to the latter? This is a fatal flaw if one believes that there are Rscales on the line; for in that case there are plenty of geometrical configurations we cannot imagine: just think of your favorite function whose graph contains infinitely many oscillations on some bounded interval (sin1/x) on (0,1] will do the job: see Spivak 1994, p. 63, Figure 20). The unimaginability of incompleteness does not give us much reason, if we bear such examples in mind, to believe that the line must be complete. Such considerations as these make it obvious to me that we do not have intuitively grounded knowledge of the completeness of the line.11 But experience has taught me that this is far from obvious to many. So let me make the point at greater length by taking a close look at a couple of sections from Dedekind's "Continuity and Irrational Numbers" (Dedekind 1872)12 where we find a pellucid exposition of the geometrical motivation for his definition of the real numbers as cuts of rationals. What Dedekind is after is a number system that can, so to speak, use up all of the points on the line. If we come to Dedekind's text assured that the line is complete, we will find in these preparatory sections of "Continuity and Irrational Numbers" a particularly felicitous review of what we already know; if our dogmatic slumbers have already been disturbed, though, those sections may only make us more wakeful still. Dedekind then launches into his analysis of the "corresponding relations of position of the points on a straight line L" (6) without arguing for the claim that those relations do correspond to the relevant order properties of Q. Here already we must be on our guard against the unexamined assumption that we somehow see this correspondence. Consider, for instance, density. This is Dedekind's Property II: "if p, r are two different points [on L], then there always exist infinitely many points that lie between p and r" (7). Clearly this is not true for the points and line segments we can draw; for the points in that case are extended (in particular, noninfinitesimal) blobs of ink, and only finitely many of them can fit in between any two. Nor does density hold for imagined points and segments; the reasoning is similar to that for the penandpaper case, but more complicated because it has to do with the mental.14 It will not help to observe what can perhaps be established by way of thoughtexperiment that any two distinct points, just in virtue of their distinctness, have space in between them where a third point may be interposed;15 for even if this is true for imagined points, we need to be told why it follows that the points on a physical line are like that. Part of the problem here is that we have not yet said explicitly what kinds of things points and lines are; perhaps when we have done so it will be clear that we can justify the attribution of certain properties to physical points on the grounds that they hold for imagined ones. Euclid tells us that "a point is that which has no parts", and that "a line is breadthless length" (Euclid 1956, vol. 1, p. 153). If points and lines are like that, then my cavils about blobs of ink are clearly irrelevant. Unfortunately, so is the appeal to imagination; for surely pictures in the mind, like pictures on paper, are only of extended things. Because we all learn our geometry, for all intents and purposes, from Euclid, it is tempting to think that we believe his axioms because intuition shows us that they are true. But if we are as modest as we should be about our intuitive capacities, this will look to us like putting the cart before the horse: what we should say is rather that Dedekind's density claim seems obvious to us because we believe Euclid's axioms. Dedekind's next move is to say that (a) we can define Qrules (see p. 66 above) on the line; and his next move after that is to say that (b) no such Qrule is a scale, i.e., that no Qrule has all the points on the line in its domain. There is no more hope than there was with density of resting (a) and (b) on intuitive grounds. But, as before, we can easily justify (a) and (b) on the basis of Euclid's axioms, which enable us to construct, given an origin on the line and a unit length, all of the rational lengths (rational, that is, with respect to that unit) and some irrational ones as well. Dedekind concludes that these facts about the line make it "absolutely necessary that [.. . ] the rational numbers be essentially improved by the creation of new numbers such that the domain of numbers shall gain the same completeness, or as we may say at once, the same continuity, as the straight line" (9). Since no Qrule is a scale, we must properly extend Q if we want every point to get a coordinate. Dedekind's principle is of course just the Completeness Axiom; I will accordingly use 'completeness' to denote the property that Dedekind denotes by 'continuity', and use the latter to denote the more or less vaguely defined property which the sharper notion of completeness is supposed to capture more exactly. If space is complete, then by the Uniqueness Theorem (p. 66) Dedekind's extension of Q by the method of cuts16 a.k.a. R is the scalar system S for space. But is space complete? We have already seen that we cannot fall back here, as we could with density, on Euclid's axioms: unless we beg the question by assuming the Completeness Axiom, those axioms tell us only that S must be Pythagorean. This does imply that it must be a proper extension of Q, which lacks many of the requisite square roots; but S could, consistently with the axioms in question, be much smaller than R, in which case space would be incomplete. Dedekind's own view of the matter is very cautious: "If space has at all a real existence, it is not necessary for it to be [complete]; many of its properties would remain the same even were it [incomplete]" (12). He does, however, seem to hold that when we imagine a continuous line, we are imagining a line with this property of completeness: "if we knew for certain that space was [incomplete], there would be nothing to prevent us, in case we so desired, from filling up its gaps, in thought, and thus making it [complete]; this filling up would consist in a creation of new pointindividuals and would have to be effected in accordance with the above principle" (12). Dedekind thus shows commendably little sympathy for the idea that we know by intuition that the line is complete. His modesty on that score does not prevent him, however, from claiming that his conception of continuity, whether or not it holds good of physical lines, is the only way of making precise our pretheoretical understanding of what it would be for the line to be continuous: he says that the imaginative "filling up would have to be effected in accordance with [his] principle" [my emphasis]. He admits that he is "utterly unable to adduce any proof of [his account's] correctness, nor has anyone the power". But he says that he thinks he will "not err in assuming that every one will at once grant [its] truth" (11). But alas, as even a cursory glance at the philosophical literature on the continuum will show, Dedekind does in fact "err in assuming that every one will at once grant" the truth of his account. Peirce, Gödel and Weyl are just three of the estimable thinkers who have doubted whether our intuitions about continuity are adequately captured by Dedekind's definition.17 I will focus mainly on an argument of Gödel's, but before taking that up I want to say a few words about one due to Peirce, which is well worth a substantial digression, both because it supports a very radical alternative to Dedekind's view, and also because it turns on considerations about time, which with my emphasis on space I have left mainly on the sidelines. How can a past idea be present? Not vicariously. Then, only by direct perception. In other words, to be present, it must be ipso facto present. That is, it cannot be wholly past; it can only be going, infinitesimally past, less past than any assignable past date. We are thus brought to the conclusion that the present is connected with the past by a series of real infinitesimal steps. It has already been suggested by psychologists that consciousness necessarily embraces an interval of time. But if a finite time be meant, the opinion is not tenable. If the sensation that precedes the present by half a second were still immediately before me, then, on the same principle, the sensation preceding that would be immediately present, and so on ad infinitum. Now, since there is a time, say a year, at the end of which an idea is no longer ipso facto present, it follows that this is true of any finite interval, however short. But to what intuitions is this consequence of completeness supposed to run counter? To be sure, if I cut a Tootsie Roll right down the middle, the two halves are (so far as I can tell by eye) mirror images of one another, but why should I take this to reveal anything about the nature of continuity? Thoughtexperiments like Gödel's highlight the shortcomings, not of Dedekind's conception, but of intuition as a source of adequacy criteria. My own image of a continuous line is just a solid black strip against a white background: it is the absence of whiteness on the strip, not the behavior of infinite sets or sequences of points, that makes me deem such an imagined line continuous. I expect that most people's images of continuity are nearer to mine than to that suggested by Dedekind's conception, but I don't see why that should tell against Dedekind's conception, any more than Dedekindian intuitions should tell in favor of it. It is one thing to say that there is no clear reason to privilege one or another of these intuitions, qua intuition, about continuity over the rest; it is quite another to say that when we develop any one of these intuitions into a fullblown mathematical account of continuity, that account is no better than one based on any of the others. Dedekind's conception of continuity gives rise to a mathematical theory of great utility and power. And unlike my own intuitive notion of "continuity as solidity", the intuitions adduced by Gödel and the others correspond to various mathematically interesting alternatives to standard real analysis. Perhaps then we ought, instead of judging each theory by its associations with one or another intuition, to judge each intuition by its association with one or another theory. I have mentioned the "great utility and power" of standard real analysis, without saying just wherein its utility and power lie. Certainly the real field has turned out to be a fascinating mathematical object, but mathematics abounds in fascinating objects: H is another one. To deserve its pride of place, R must have more going for it than that. Certainly one thing it has going for it is the organizing role it plays in analytic geometry, and especially in the applied analytic geometry we use to study physical space. And now we seem to have come full circle; for our original question was how we know that the reals, and not the hyperreals, are best suited to that organizing role. But surely it counts for something that upon opening any text on spacetime physics we find R and not H on every page. Perhaps we have come full circle because this is where we should have stood our ground in the first place. Of course the original question was not whether R in fact dominates physical geometry it obviously does but whether it has to do so: whether there is any alternative. For the question to be interesting it must be about alternatives that do not require us to trade in a (largely) true physics for a (largely) false one, or otherwise to degrade the state of science. So in posing our question we moot the possibility that we might change our mathematics without prejudice to our physics. If we cannot do that, if the physics we now have falls apart without R as a scalar system, then we have good reason to suppose that space is complete, and that physical lines are real and not hyperreal lines. We would need, in that case, to be presented with a different and better physics, based on H rather than R, before we could reasonably throw over the real in favor of the hyperreal line. We could then comfortably leave partisans of the latter with the burden of proof, and stick with the former until they had met that burden. This defense of the real line is, at bottom, an inference to the best explanation, an abduction. The fact supposing that it is a fact that our best physical theories cannot get by without real coordinates is, so the runup to the inference goes, best explained by the hypothesis that space is complete, that physical lines are real lines. Alternatively (which is not to say equivalently) we may regard the completeness of space as a hypothesis which is empirically confirmed along with the physical theories in which it plays an indispensable role. This talk of indispensability and the empirical confirmation of mathematical hypotheses should call to mind the names of Quine and Putnam, who have urged that mathematics is inextricably woven into our scientific theories in just the way that our imagined defense of the real line requires. This kind of abductive argument requires us to show that real coordinates are in some sense necessary for some chunk of physical theory we would be loath to give up. Consider, as a simple example, Kepler's Law of Areas, whose loss would be debilitating indeed for Newtonian physics. In the De motu (De Gandt 1995, p. 22) (and cf. Proposition 1 of Book I, § 2 of the Principia),25 Newton gives a proof which begins by supposing that the force that impels the moving body B towards the central point p comes in pulses, resulting in the kind of polygonal path depicted in Figure 4. He then shows, by a purely Euclidean argument (i.e., one requiring no ideas from the calculus), that in this case the radial vector sweeps out equal areas in equal times. He extends the result to the case we are really interested in as follows: "Now let these triangles be infinite in number and infinitely small, so that each triangle corresponds to a single moment of time, and with the centripetal force then acting unremittingly, the proposition will be established." Suppose for a moment that we could make detailed physical and mathematical sense of this argument, and that no proof of the result were available that did not bring in, at some point, infinitely small geometrical objects. Then so long as Newton's physics was the physics of choice, we would be justified in holding that space actually contained such objects. In that case we would have abductive grounds for rejecting the real line (which leaves no room for infinitesimal triangles) in favor of something more like the hyperreal one. But of course it is hard to make detailed sense of the argument. For if one of those little triangles T say Δ pq1q2 really is a triangle, then the vertices q1 and q2 on B's path determine a straight line segment of nonzero length, corresponding to a period of time in which B cannot be subject to a force, since it is moving in a straight line. So the centripetal force is not being exerted continuously after all. If q1 and q2 do not determine a segment, then they are identical and T is not a triangle but a line segment and so cannot contribute as Newton supposes it can to the area swept out by B. Such intimations of inconsistency would have to be set in the balance along with the apparent indispensability of infinitesimals, in the days before limits came along; but even then one would have been hard put to argue abductively for the reality of physical infinitesimals, when the mathematics of infinitesimals had not yet been shown to be free of contradiction. The situation is different, of course, with the CauchyWeierstrass definition of limit, and the rigorous theory of real numbers that it made possible. 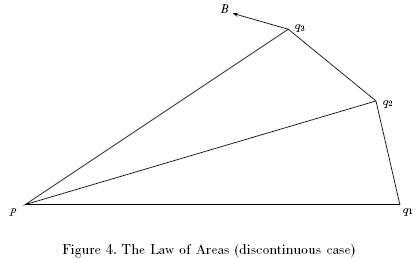 A proof of the Law of Areas, free of infinitely small triangles, can be found in any number of modern calculus texts: a particularly pleasing treatment can be found in Bressoud 1991 (pp. 1824). The first and decisive move in the proof is to suppose that the space in which the body is moving is a complete manifold, and to represent its position, velocity and acceleration as vectorvalued functions of time. Physical assumptions e.g., that the acceleration is always directed towards the same central point are translated into mathematical assumptions about the manifold and the functions; the Law of Areas is then proved as a fact about functions and manifolds satisfying those assumptions. This gives us the raw materials for our abduction, which goes as follows: the Law of Areas is wellconfirmed by our observations of the heavenly bodies, and this is best explained by the hypothesis that the space in which those bodies move is, like the manifold in the proof, a complete manifold. This is a fairly weak abductive argument for the completeness of space, because it puts completeness forth as the best explanation for a single wellconfirmed generalization. But if we could argue similarly for other such generalizations, and found none that were best explained by the failure of completeness, the argument would gather strength accordingly. The point of the abduction is to show that the manifold is complete, not just that it is a manifold, whose scalar system could be any Pythagorean field. It is thus essential, for purposes of the abduction, that the proof of the Law of Areas should depend upon the completeness of the manifold. But it is not hard to formulate weaker conditions on the manifold which will enable the proof to go through, and are satisfied by H as well as R.
One such condition is that of being what I will call a transfer field. A transfer field is an ordered field that satisfies every truth about R expressible in the firstorder language LR which has a constant symbol for every real number and relation and function symbols for all relations and functions on R. The reader can easily verify that, e.g., Bressoud's proof relies only on lemmas that hold good for any transfer field. The Completeness Axiom, because it contains a secondorder quantifier, is not expressible in LR, and so a transfer field need not be complete; in particular, H is a transfer field, and so the Law of Areas would hold good (given the requisite physical hypotheses) if lines in space were hyperreal lines. One simple example casts very little light, of course, on the larger question about real vs. hyperreal lines. But it does illustrate the kinds of arguments that come into play, and gives us one case at least in which physics can live without completeness, and so without real lines. The condition of being a transfer field is not a very subtle one, and like completeness itself is overkill for purposes of establishing the Law of Areas: it would have been enough at the cost of complicating the verification left to the reader to stipulate that the scalar system of the manifold should be a model of firstorder real analysis (i.e., of the theory of ordered fields plus an axiom scheme guaranteeing that each firstorder definable subset of the field has a leastupper bound if it is nonempty and bounded above). Feferman's elaborations of Weyl's predicative theory of the continuum suggests that firstorder analysis too is overkill, across the board of physical applications (Feferman 1998). The abductive case for Completeness hangs in the balance of this ongoing debate over the strength of scientifically applicable mathematics. So even if physics in its present state gives us the final word about the geometry of spacetime, we have some work to do before we can abductively infer that physical lines are real lines. And even then our assurance that Figure 1, and not Figure 2, gets physical lines right will be subject to change along with the state of physics. Our understanding of physical geometry has already been overhauled in the transition from classical to contemporary physics, from Newton to Einstein; and basic geometrical hypotheses including the continuity of spacetime continue to be up for grabs along the advancing front of physical theory. For example, in The Character of Physical Law, Feynman guesses "that the theory that space is continuous is wrong" (Feynman 1967, p. 166), mainly because it gives rise to the troublesome infinities of quantum electrodynamics.26 Chris Isham, in his survey of quantum gravity, calls the assumption of continuity a "gross extrapolation from everyday experience", and points out (very much in the skeptical spirit of the present essay) that "the construction of a 'real' number from integers and fractions is a very abstract mathematical procedure, and there is no a priori reason why it should be reflected in the empirical world" (Isham 1989, p. 72). And Brian Greene, in his popular treatment of string theory, points out that the "fundamental incompatibility between general relativity and quantum mechanics" has to do with the smallscale geometry of space: "The notion of a smooth spatial geometry, the central principle of general relativity, is destroyed by the violent fluctuations of the quantum world on short distance scales" (Greene 1999, p. 129). I am not competent to offer any indepth commentary on string theory and its implications; but even an amateur can make a few observations that might help underscore and clarify some main points of the present essay. First of all, string theory, like previous revolutionary physical theories, revises our picture of spacetime geometry in a highly counterintuitive way. To take just one example, it postulates not four, but ten (Greene 1999, pp. 203205) or perhaps eleven (Greene 1999, pp. 308312) spacetime dimensions one temporal and nine (or ten) spatial. We experience space as threedimensional because all but three of the spatial dimensions are "curled up"; much as a garden hose (Greene 1999, pp. 186196), viewed from the side and at a distance, appears twodimensional because one of its dimensions "curls" away from the eye, the additional curledup dimensions of space are so small as to be indiscernible by sight. Hard to swallow, to be sure, but arguably well worth swallowing for the lavish explanatory payoff: the extra dimensions enable us to explain the apparent jumble of particle masses and charges very elegantly indeed, in terms of the vibrations of strings in all the dimensions, unfurled and curled (Greene 1999, pp. 205206). So the first point, already evident from relativity and quantum mechanics, is that intuition (other things being equal) is no match for explanatory power. The second point is partly implicit in the foregoing example, and is also more controversial (whence the ceteris paribus hedge in the last sentence): it is that inaccessibility to direct observation is not an insuperable obstacle to acceptance as wellconfirmed. In a way this is a platitude, though even so obvious a case in point as the history of atomic theory raises subtle questions about just how far from observation scientists are really prepared to stray27 and the works cited there. In connection with string theory the point becomes still less platitudinous, as empirical support is widely recognized to be that theory's Achilles' heel.28 Even so, the mere fact that "[w]ithout monumental technological breakthroughs, we will never be able to focus on the tiny length scales necessary to see a string directly" (Greene 1999, p. 215) does not disqualify strings from admission to our scientific ontology; and I submit that the difference, on this score, between things as small as strings and distances infinitely small, is one of degree and not of kind. We might come to have evidence no doubt largely indirect that would justify belief in either species of minutiae, despite their utter remoteness from observation. 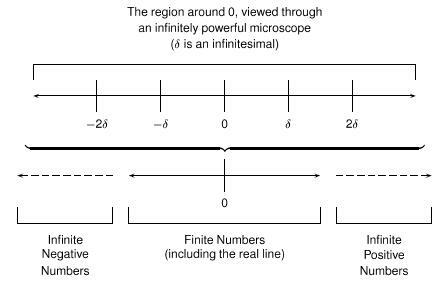 If there is a nonzero lower limit on finitely small distances, then so much the worse, it would seem, for infinitely small ones. Indeed, if the smallest constituents of matter are extended, there may be something to the Peircean rejection of points (if not to Peircean infinitesimals). I belabor this third point in order to forestall a misunderstanding that has often arisen in discussion. I am not arguing that we do have abductive grounds for replacing real with hyperral lines only that we could, under the right circumstances. If string theory ever ascends to the throne of "our best physical theory," both the real and the hyperreal lines may be demoted to the rank of possibly harmless but useful falsifications of physical reality. If so, so be it my aim here has not been to create an air of inevitability around the hyperreals, but to dispel the one around the reals. 1 The rigorous study of nonArchimedean number systems did not begin with Robinson. See, in addition to Ehrlich's recent historical survey (Ehrlich 2006) and the essays in Ehrlich 1994, Robinson's own historical remarks in Robinson 1996, pp. 277279. 2 Putnam touches on this consensus in Putnam 1979, p. 64: "Consider the basic postulate upon which the subject of analytical geometry is founded (and with it the whole study of space in modern mathematics, including the topological theory of manifolds). This is the postulate that there is a onetoone order preserving correspondence between the points on the line and the real numbers." Explicit endorsements of the consensus are scarce in the literature, but I have found it to be alive and well in discussions of the question with both philosophers and physicists. Those who recognize the need for an argument tend, like the great figures discussed on pp. 73ff below, to fall back on intuition: hence the present essay. 4 My discussion of Hilbert's axioms is based on the English translation (Hilbert 1971) of the 10th German edition. 5 A referee points out, quite correctly, that 'manifold' already has a wellestablished technical usage in topology and differential geometry. Readers familiar with the term from those other contexts should bear in mind that I use it in the sense just defined. 7 These are extensions to three dimensions of theorems for the plane; for proofs of the latter, see Hartshorne 2000, pp. 187190. 8 For the first of these, we choose an arbitrary point o on our line L to get the coordinate 0 and then use the Euclidean distance formula, together with a designation of the points of L on one side of o as negative and those on the other side as positive, to assign coordinates to the rest. For the second, we let the line L with the scale serve as our xaxis and choose two lines orthogonal to L and to one another as the other axes, along with positive and negative directions on each. We then copy the scale on L onto the other axes, padding the coordinates out to coordinate triples by adding two zeroes in the appropriate slots. The coordinates of points off the axes are determined in the usual way by taking the perpendicular distances to the axes. 9 This vignette has been carefully worded to avoid further and in the present context extraneous complications arising from the ordering of the Robinsonian infinitesimals. It would be nice if we could have Abby and Richard travel in lockstep so that, e.g., after n hours the former lay n X , and the latter 2n, meters away from 0A. The trouble is that though this would get Richard through all of his points, it would not get Abby through all of his; for there will be points infinitely close to o a whose distance from it exceeds n × ε meters for any standard natural number n. Abby would have to travel an infinitely long time he would have to travel m hours for some infinite (hyper)natural number m in order to reach such a point. So it means one thing to say that Richard will "eventually" pass through all of his points, and another to say that Abby will "eventually" pass through all of his. It might seem that we could make "eventually" univocal by allowing Abby's speed to vary, by choosing points pi, i N, whose distances di form a monotone increasing sequence of infinitesimals, such that in passing through all the pi Abby would pass through all the points infinitely close to 0A but without hitting any that lie at a finite distance from it. But this won't work either, not even if we make no attempt to choose the pi in a nice rulegoverned way, as we do with Richard's points; for any monotone increasing sequence of infinitesimals di, i N, has an infinitesimal upper bound (Goldblatt 1998, p. 140). I have passed over these complications in the body of the paper because they involve time as well as space, and the purpose of the Abby/Richard example was to make vivid the geometrical strangeness of the hyperreal line. Of course if we wanted to do physics with that line, and in particular to bring it into our analysis of motion, time would have to come into the picture, and these further complications would have to be faced up to. 10 One kind of intuition with a long philosophical pedigree, which I will not take up in the body of this paper, is rational intuition, which in the case in hand could assure us in a way that does not involve access to objects that it is somehow "of the essence" of the line that it should be complete. This would be an instance of what Charles Parsons calls "intuition that", whereas I will focus here on what I find to be a particularly plausible instance of what Parsons calls "intuition of". On the distinction between these two kinds of intuition, see Parsons 19791980, p. 96 and Parsons 1995, pp. 5859. The challenge for advocates of "intuition that" is showing that their intuitions are more than "gut feelings" with no particular epistemic force. For a somewhat more extended treatment, see Moore 2002, pp. 186189. 11 In Moore 2002, which is something of a companion piece to this one, I consider and reject intuitive justifications for the Archimedean Axiom. 12 In what follows I will give page references to this work by simply listing the page number in parentheses e.g., "(7)" using the pagination of Beman's translation (Dedekind 1963, pp. 127). 13 Dedekind's list of properties does not amount to a thorough axiomatization of that theory, but he pretty clearly has the full theory in mind: he says that Q "forms a wellarranged domain of one dimension extending to infinity on both sides" (5). 14 Of course, if we can imagine regions infinitesimal relative to others, that clears away one obstacle to imagining two points with infinitely many points in between; in that case the reasoning from the penandink case would not carry over to an imagined line segment. I take it to be obvious that we cannot imagine two regions where one is infinitesimal to the other. If you do not, note that anyone says they can imagine that will owe us an explanation of how they know that the smaller region is infinitesimal, and it is hard to see how they can do that if they can only imagine finitely many copies of the allegedly infinitesimal region (cf. Moore 2002, p. 198). I am content to leave the burden of proof with those who maintain that our imaginative capacities are not subject to the latter restriction. To be sure, even if the burden of proof cannot be discharged, that shows only that we cannot know that one imagined region is infinitely small relative to another. But that suffices for my present purpose, which is not to show that physical lines, or even imagined lines, are not dense; my point is rather that we cannot intuitively justify our belief in their density by drawing or imagining points (which in order to be seen or imagined must be extended) on lines. 15 We might seek, for instance, to ground this claim in the relatively modest form of mathematical intuition explored by Parsons in Parsons 19791980. In § V of that paper, he argues that elementary and intuitively given facts about figures against a surrounding ground make intuitively evident the possibility of a structure (a string of strokes) to which one more (stroke) can always be added. Analogously, we might argue that to imagine two distinct points is to imagine points with an intervening space in between, and that the very presence of that space makes it evident that a third point can be introduced in between, and thus distinct from both of, the original pair. But how do we know that the intervening space is not too small to hold the new point? This might happen if there were some lower bound on the size of points. It is hard to get a grip on the claim which would obviate this worry that we can imagine arbitrarily small spatial regions, but even if we somehow convinced ourselves that we could do that, we would still face the difficulty of getting from there to the corresponding claim about points in space. The Euclidean notion of an extensionless point frees us from worries about points being too big for some britches but extensionlessness of points is hardly a deliverance of intuition. 16 A nonempty proper subset C of Q is a (left) Dedekind cut just in case it has no greatest element and is closed under < (i.e., for every a C, b C provided that a > b Q. 17 I will concentrate here on Gödel and Peirce. Weyl discusses our intuitions about continuity in Weyl 1921, pp. 92, 9395 and Weyl 1925, pp. 123124, 135. 18 All the assumptions, that is, that survive the switch to hyperreal coordinates. 19 For an excellent discussion of Brouwer and Weyl's grounding of the intuitive continuum in our consciousness of time, and the connections with Husserl's phenomenology, see van Atten, van Dalen, and Tieszen 2002, pp. 205212. 20 This view of the continuum, and its descendants, are pervasive in Peirce's writings from the 1890s on; see especially his expositions in the third (Peirce 1898b) and eighth (Peirce 1898a) Cambridge Conferences Lectures, and also Peirce 1900. The relevant secondary literature is large and growing, especially so since the publication of Putnam 1992; particular mention should be made of the mathematical chapters in Murphey's pioneering study (Murphey 1961) and Havenel's comprehensive dissertation on the subject (Havenel 2006). Further references can be found in the bibliography of Moore 2007. 21 For more on this argument and its antecedents, see Moore 2007, pp. 427431, 434435. 22 See especially Peirce 1896(? ), pp. 5963. 23 It is considerations about consciousness that lead to Peirce's denial that time is composed of durationless instants and his affirmation of infinitesimals. Michael Dummett argues for the denial, without the affirmation, as a way of banishing certain problematic discontinuities from physical theory. One of his examples, of two ways of instantaneously shutting off a lamp (Dummett 2000, pp. 501502) is interestingly akin to the Gödelian argument I am about to discuss. For more on that example, see Ulrich Meyer's critique (Meyer 2005, pp. 136137) and Dummett's response (Dummett 2005). 23 Putnam and Ketner talk of dividing the line "at a point" rather than "in two" as in my emended version of the passage. They cite an unpublished note of Gödel's as the source of the remark. 25 Newton 1999, pp. 444445. 26 He takes up the theme again in Feynman 1988, pp. 128129. 27 See Maddy 1997, pp. 135143. 28 Greene devotes an entire chapter (1999, pp. 210227) to this issue. 29 Cf. Feynman's speculative diagnosis of the need for renormalization: "[P]erhaps the idea that two points can be infinitely close together is wrong the assumption that we can use geometry down to the last notch is false" (Feynman 1988). 30 Versions of this paper were presented to audiences at the University of Illinois at Chicago, Northwestern University, Colgate University and Brooklyn College. Thanks to all who participated for hearing me out, and for their questions and comments. Thanks also to the referees for this journal, for their perceptive and useful suggestions. My teacher, W.D. Hart, got me started on these issues several years ago; for that, and a great deal more, I thank him.